I love getting post. It's a lovely feeling to see a package arrive with your name on it. Even more so if it's got some goodies in it. 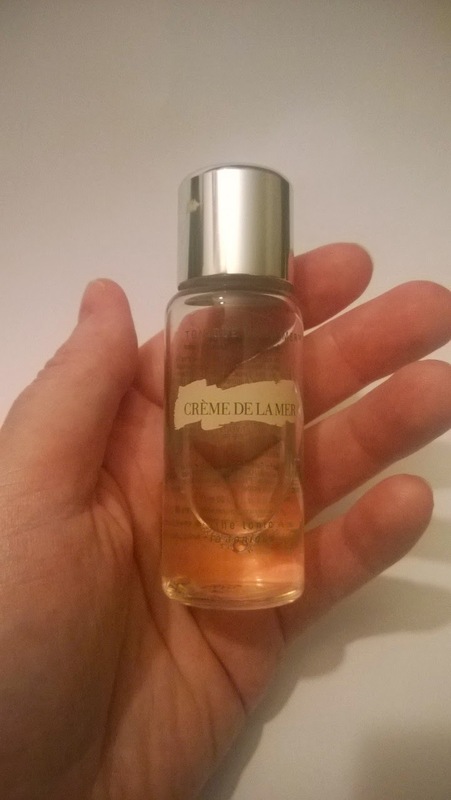 Contained in a recent one was a 30ml sample size the product I'm reviewing today - Crème de la Mer's The Tonic. I did a little happy dance when I saw this product in my little package. Who wouldn't like a little CDLM in their lives for a while! This is a toner. They may call it a tonic but it is, in fact, a toner. Whether you use a toner, or not, or whether you should use one at all is another day's post but toners have been part of my skincare routine for many years now. I love using a toner and it's a step I never skip (morning and evening). My yard stick for a toner is the Lotion Confort toner by Chanel. It has been my toner of choice for several years now so the CDLM would have to be really really good to tempt me away from it. According to CDLM, "this tonic works to revitalise, calm and tone the skin after cleansing, leaving it purified to reveal a healthy glow". For once, the marketing blurb is a pretty accurate description of how the product performs "in the flesh"! This feels lovely and fresh on the skin when you apply it. For me it does calm and tone the skin after cleansing. However it doesn't feel as hydrating as the Chanel toner does. Having said that, this still feels really nice on the skin. I think this would be gorgeous to use in the summer months, or if you were hovering around "normal" skintype (normal-to-dry and probably normal-to-oily), but I'm not sure how well you would fare with The Tonic if your happens to be straight-up or "particularly" oily (there is an "Oil Absorbing Tonic" available too - this would probably suit you then). Scent wise, it smells similar-ish to other CDLM products but the scent is so light, it's barely discernible so even if you're sensitive to smells, it certainly isn't an issue here. Ingredients-wise, it contains CDLM's "Miracle Broth" along with a bunch of other ingredients - no alcohol at least. So, break it to me - how much is it?